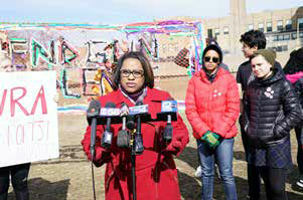 Dr. Driver stood in support of more than 1,000 students at Rufus King High School. On March 14, 2018, students around the country and in Milwaukee Public Schools participated in the student-led National School Walkout. It called for students to gather outside school at 10 a.m. for 17 minutes – one minute for each of the individuals killed during the shooting at Marjory Stoneman Douglas High School in Florida last month. At every MPS school participating in the walkout, students were respectful and followed district guidelines for the demonstration. District leaders, teachers and staff expressed their pride at the way students handled themselves for this unique event. From a tragic situation, Milwaukee’s young people took the opportunity to build on a movement and use their own voices and to participate in civic engagement. Students filed out in rows around the Rufus King track in a silent and respectful remembrance of the lives lost in Florida as the names of those lost were read over the loud speaker. Afterward, student leaders gathered students and staff in the middle of the field and spoke passionately and eloquently about the actions they wish to see from lawmakers. Two students read spoken word poems for the crowd. MPS administrators remarked that in an age of hands-on learning, this event made a powerful impact on students and delivered a unique, unforgettable experience. Schools across the district took this opportunity to talk about civic engagement, the Bill of Rights, gun regulation, and more in a variety of age-appropriate experiences.